Step into the traditional Joglo-structure villa with stylish furniture in a 4 bedroom setting and an open-plan concept. 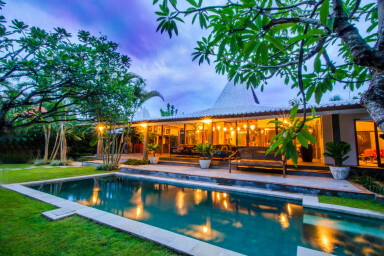 Villa Samadi is surrounded by lush garden with its own private swimming pool in the happening area of Canggu. Perfect for the surfers with family or group of friends who want to enjoy the hip scene. With colorful décor and vintage nuance, the villa also has a next-door villa (Samadi 2) that rented together can accommodate up to 14 guests in total. Free WIFI and local mobile phone to be used in the Villa.